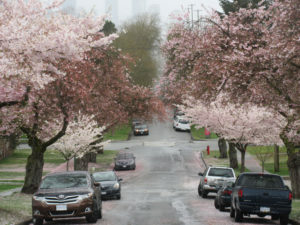 On 5th avenue (corner Lilooet), you’ll find two different kinds of trees: Accolade and Akebono cherry trees (notice the different colours on the photo). Akebono cherry trees are lighter and blossoms have five petals. Accolade cherry trees are darker and blossoms have more than five petals. When I visited, the Accolade were declining and the Akebono were peaking. From the top of the hill, you get an amazing view of the highrises in Burnaby Brentwood area. Visit soon to be showered with petals or use our neighbourhood map to find Akebono trees near you.